SONTAL BioActive Marine Collagen is a “state of the art” nutri-cosmetic supplement designed to promote healthy, strong and hydrated skin that looks and feels more youthful. • With every passing year your wrinkles become worse. • Prevent wrinkle formation on your skin. Stimulate collagen production with SONTAL BioActive Marine Collagen. • You can maintain optimal skin health and look more youthful. • Increases skin’s elasticity, moisture level and retention. • Improves joint and cartilage health. Why do you need collagen supplementation? 30% of the protein in your body consists of collagen. From 20 years of age the production of collagen by your body starts to decline. From age 25 your collagen stores decline by as much as 1.5% per year. At the age of 40 your collagen stores have declined by approximately 50%. It is therefore wise to take collagen as a dietary supplement. By taking a daily dose of 10g 2000 Dalton Hydrolysed BioActive Collagen will help slow down the loss of collagen and therefore help slowing down the effects of ageing. BioActive Marine Collagen works “from inside” to increase the beauty of your skin. Marine Collagen is a key nutrient for skin beauty. 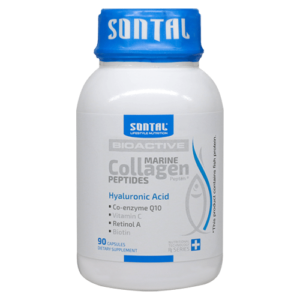 SONTAL Marine Collagen are bio-active peptides highly concentrated in skin’s essential amino-acids which the body can easily absorb on a daily basis. Our Marine Collagen may stimulate the production of collagen by the skin cells themselves and help maintain youthful, vibrant skin and fight the skin’s continuous ageing process by re-densifying the dermis. Among the most important new dermatologic discoveries is the power of vitamin C to counter the effects of sun exposure. It works by reducing the damage caused by free radicals, a harmful by product of sunlight, smoke, and pollution. Free radicals gobble up collagen and elastin, the fibers that support skin structure, causing wrinkles and other signs of aging. Hyaluronic Acid: doctors say it also plays a role with skin cells, acting as a kind of glue that helps hold them together, keeping skin looking smoother and younger. Another plus is its ability to hold water, up to 1,000 times its weight, which means more moisture in each skin cell. Co-enzyme Q10: CoQ10 in the body almost inevitably decline with age. In most people over thirty, levels of CoQ10 in the skin are below optimum, resulting in lesser ability to produce collagen, elastin and other important skin molecules. CoQ10 may boost skin repair and regeneration and reduce free radical damage. Vitamin A Retinol: If your Vitamin A levels drop even a little below normal, you’re likely to see some skin-related symptoms, including a dry, flaky complexion. That’s because vitamin A is necessary for the maintenance and repair of skin tissue. Biotin: Biotin is one of the best known vitamins which provide beauty benefits to skin, hair, and nail. Many people see a noticeable improvement in hair, skin, and nails after they begin taking a biotin supplement. Biotin deficiency can lead to skin problems such as rashes, dryness, itchiness and seborrheic dermatitis in adults. Who should use SONTAL BioActive Marine Collagen? Healthy individuals older than 25 years of age concerned with the health and condition of their skin. The primary aim of this formula is to supply you with some of the important nutrients to help maintain optimal skin health. The recommended dosage is 2 x Capsules per day, providing you with 800 mg of bio-active marine collagen. It is not possible to supply the optimum dosage for collagen supplementation, 10g of hydrolysed collagen, in capsules. It will result in a minimum of 22 Capsules. We therefore recommend that you use one of our powder bio-active collagen products if your aim is optimal collagen supplementation. SONTAL BioActive Marine Collagen could be used as single dietary supplement or could be combined with other SONTAL products. Directions for use: As a dietary supplement adults should take two (2) capsules after their evening meal.